A3 Stripped Upper Machined from strong 7075-T6 aluminum forgings and hard coat anodized for supreme corrosion resistance. 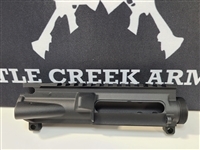 This AR15 stripped upper receiver is a great start for your next build. Mil-Spec AR15 5.56mm Forged A3 Anodized Upper Receiver made from 7075-T6 Aluminum includes M4 feed ramps; These Uppers DO NOT have Forward Assist or Ejection Port Cover capabilities. Made in the USA!! The Anderson Manufacturing AR-15 Stripped Upper Receiver is built to MIL-SPEC. Crafted from a 7075-T6 aluminum forging and machined with M4 feed ramps. Featuring an extended and widened ejection port for proper ejection of larger .458 SOCOM cartridges. This stripped model does not include a forward assist or ejection port cover. 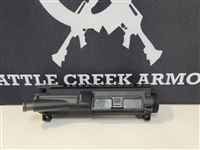 Compatible with MIL-SPEC AR-15 lower receivers. Mil Spec AR15 5.56mm A3 Upper Receiver with M4 Feed Ramps Anodized Black assembled with Forward Assist and Ejection Port Cover. Made in the USA!! A3 Flat Top Upper Receiver Assembly is fully Mil-Spec with machined M4 feed ramps. Assembled with Forward Assist and Ejection Port Cover. Machined from forged 7075 T6 aluminum, the assembled upper receiver is precision-machined to M16/M4 specification and features M4 feedramps. This unit comes assembled with both the port door and forward assist hardware.